Charles Overby is a leader who knows our democratic society thrives only when the fragile freedom of the press and other First Amendment rights are protected. This longtime champion for the basic freedoms of all Americans sees the United States as possibly being one generation away from losing the First Amendment and a free press. “Each generation must pass on to the next generation the value of a free press in order for that freedom to survive,” Overby says. 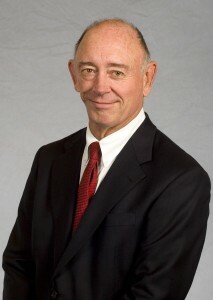 Overby is the former chairman of the Freedom Forum, Newseum, and Diversity Institute. For 22 years he was chief executive officer of the Freedom Forum, a non-partisan foundation that educates about the press and the First Amendment. His service as CEO of the Newseum spanned 1997 to 2011, during which time he supervised the building of the Newseum on Pennsylvania Avenue in Washington, D.C. Today this major specialty museum is called the “best experience Washington has to offer.” He also was CEO of the Diversity Institute, a school created in 2001to teach journalists and aspiring journalists while increasing diversity in newsrooms. In 2008, the Overby Center for Southern Journalism and Politics was established at Ole Miss with a $5.4 million gift from the Freedom Forum to honor Overby’s extensive professional contributions. This honor seems fitting considering his serving as The Daily Mississippian editor and working in the Ole Miss office of Sports Information. The Overby Center, which works closely with the Meek School of Journalism and New Media, helps create a better understanding of the media, politicians, and the role of the First Amendment, while offering a forum for discussion of major issues affecting the region, nation, and world. Before joining the Freedom Forum, Overby was a newspaper reporter and editor for 17 years effectively protecting the rights of citizens by keeping them informed. As a reporter, he covered Congress, the U.S. Supreme Court, the White House and presidential campaigns for the Gannett Co., Inc., the nation’s largest newspaper company. Overby also was the top editor at Florida Today in Melbourne, Fla., and the executive editor of The Clarion-Ledger and Jackson Daily News in Jackson, Miss. Overby supervised the news and editorial coverage that led to The Clarion-Ledger winning the Pulitzer Prize Gold Medal for Distinguished Public Service in 1983 for coverage of the need for education reform in Mississippi. His distinguished career—which began when he was an 11-year-old delivering newspapers at 5 a.m. for The Clarion-Ledger—also includes serving as vice president of news and communications for Gannett and as a member of the management committees of Gannett and USA TODAY. He enjoyed two stints in government, as press assistant to Sen. John Stennis, a Democrat from Mississippi, and special assistant for administration to Gov. Lamar Alexander, a Republican from Tennessee. He and his wife, Andrea, live in Franklin, Tenn., and have three children and three grandchildren.